A reliable and sturdy lawn mower, the Webb 17in Petrol Cylinder mower is a traditional machine that gets the grass cutting job done with care and precision. With a Loncin 118cc engine, this machine isn’t the liveliest but it has enough power to cut an average (albeit very flat) domestic garden of 100 square metres or so. The 5 bladed hardened steel cutting cylinder, which is 17in/43cm, gives a neat and clean chop on each blade of grass, making the finished product even and presentable. 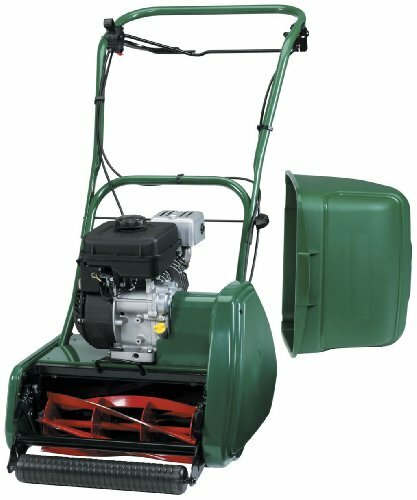 This mower comes with a 3-way drive system that can be altered depending on what technique you want to you use. You can either choose drive, or cut (which makes the steering somewhat easier as the lawn mower will focus on driving first and then cutting grass). Otherwise you can choose just the drive setting which disables the cutters so you can drive the machine back to its storage area. . 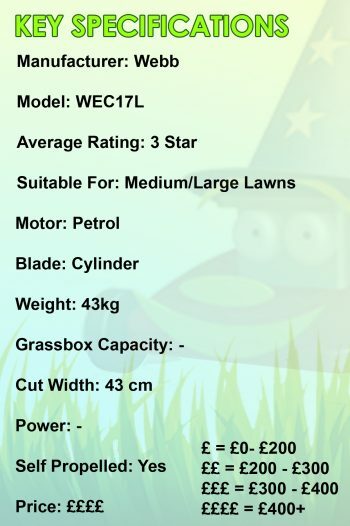 This lawn mower has a 5 position height adjustment for the blade which ranges from 10-35mm, more than capable for dealing with all lengths of grass – although we would only really recommend it for regular use on short grass. The setup is complete with a polypropylene grass box, so you can rest assured all those grass cuttings won’t be scattering about your garden making the place look untidy. This lawn mower has a unique design with a plastic front roller and a steel rear roller, giving twice the rolling effect on the grass, whilst maintaining a compact and lightweight design that’s easy to transport and store. The foldable handlebars are also a real bonus when storing the lawn mower. Generally, this is a practical and useful lawn mower for small, carefully crafted lawns. It doesn’t boast stylish designs and state of the art features; rather it is a simple and effective machine that fulfills its purpose with the ethos of tradition at its heart. If you are looking for a snazzy lawn mower with all the latest bling attached, this (and indeed any other cylinder model) might not be the mower for you.